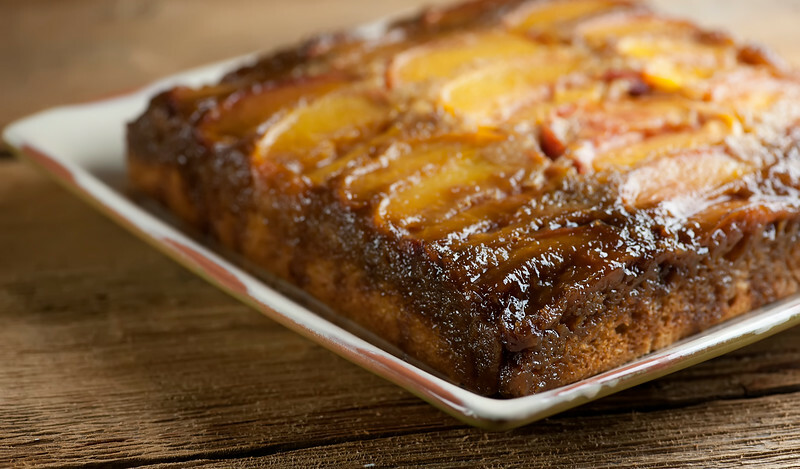 This easy recipe for peach upside down cake is one of the best summer desserts around. Simple to make and rich with the flavors of brown sugar, vanilla, and of course, sweet juicy peaches! Just like Grandma used to make. Every once in a while the Southern husband remembers a dish his mama used to make for him, and he gets that look of fond memories in his brown eyes, which immediately makes me want to recreate whatever that was. In this case, he was remembering her peach upside down cake, full of juicy Georgia peaches and a creamy crunchy brown sugar topping, with a sweet buttermilk cake underneath. So I got me some peaches (and okay, they were New Jersey peaches) and sprang into action. Ready for a sweet and simple peach dessert just like the Southern husband’s mama used to make? Let’s make it! I will start out by saying I may be rushing the peach season just a tiny bit up here in the Northeast, but it’s right on track for my friends down South. Apparently there is all kinds of debate about when prime peach season actually is, but my advice to you is when you find a gorgeous-smelling, just slightly soft peach, you know you are smack in the middle of it. Grab a few and let’s make cake. 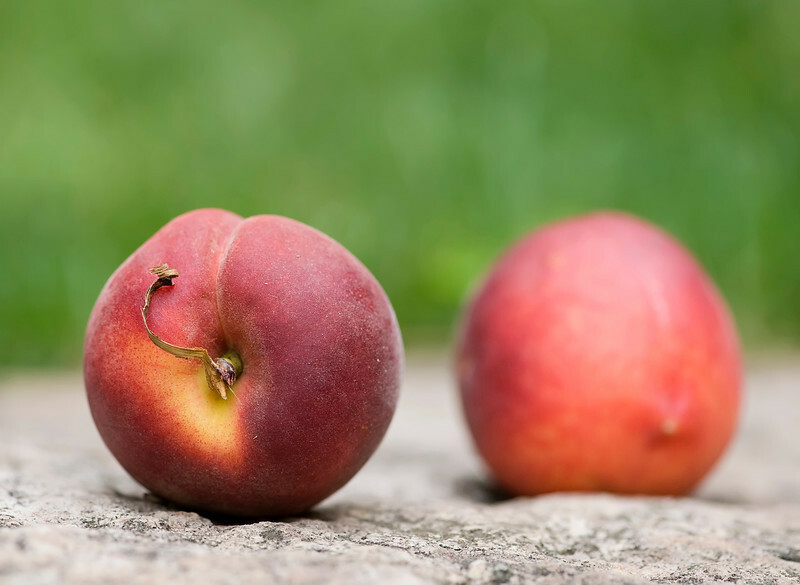 Peaches should always be stored at room temperature and not in the fridge, and you want to use them within a few days. We always use them within a few hours/minutes/seconds in my house. Meanwhile back at the upside down peach cake, you are going to coat an 8 inch square baking pan with butter and sprinkle the bottom with brown sugar. Cut your peaches into nice thin wedges – I go for about 12 wedges per peach, and no need to peel them – and put them in a single pretty layer along the bottom of the pan. Now you are going to mix up the super simple batter (and since you will probably have leftover buttermilk, here comes my regular plea to use it to make your own delectably easy ricotta cheese while the cake is baking!). Once the cake is done, let it cool completely (I know! So hard!) and then place a pretty plate on top of the baking plan and gently flip it over. The cake will now be sitting peach-side-up on the plate, ready to be cut into pieces and served up. And yes, it’s pretty much mandatory to plunk a generous scoop of vanilla ice cream on top! What’s YOUR favorite traditional summertime dessert? Preheat oven to 350 and spread the softened butter all over the bottom and sides of an 8 inch square baking pan. Spread the brown sugar over the bottom of the pan, and then put the peach wedges in a single layer across the sugar, covering the full bottom of the pan. Mix together the flour, granulated sugar, baking powder, cinnamon, nutmeg and baking soda in a large mixing bowl. Mix together the vegetable oil, vanilla, buttermilk and eggs. Pour this egg mixture into the flour mixture and stir until well combined. Now pour the batter evenly over your sliced peaches. Bake for 40 minutes or until cake is set (a toothpick stuck into the center should come out clean). Let the cake cool for about ten minutes, and then slide a knife around the edges to loosen it. Let it cool completely. Now! Here comes the exciting part. Place a serving dish over the top of the baking dish and carefully flip it over so the cake comes out peach side up. Cut into squares, and I won’t tell anyone if you serve it up with some vanilla ice cream on top of each piece! Oh my! I’m looking at that peachy goodness and thinking what an awesome breakfast that would be! Like coffee cake, only with ice cream on top! Speaking of ice cream…that is my go-to dessert, snack, treat for summer. I have two ice cream machines and one of those has a spare freezing container, so I have the power to make THREE batches of ice cream in a very short time. And, a lot of times, I DO make three batches. What can I say…the family all have different favorite flavors. 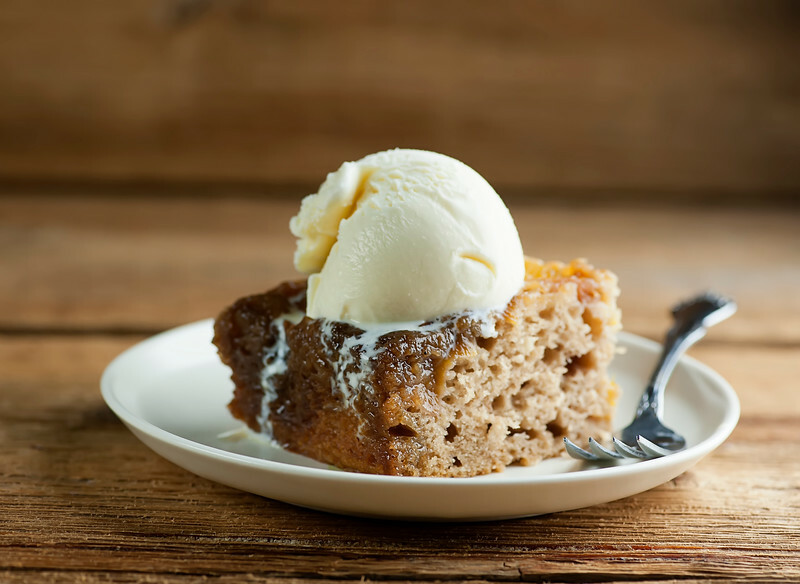 I make a cinnamon ice cream that I bet would be really tasty on top of that peach updside down cake…just saying. Thanks for another fabulous recipe, Kate! Oh my gosh, cinnamon ice cream – my heart is going pitter-pat! YUM. Can I use canned or frozen peaches? I love fresh peaches but find them extremely difficult to peel? Any tricks? Hi Cathy! First of all, you don’t need to peel the peaches for this upside down cake – I just cut them into wedges and use them peel and all! But you definitely can substitute in frozen peaches (make sure they are totally thawed of course) or canned – just rinse off any of the “can juice” they come in first. Happy peach cake!